It’s hard to believe that the Mercedes-Benz A45 AMG is made by the same company that created the SLS AMG Black Series and other aggressive performance models. This isn’t a sports car with a 6.2-liter V8, it’s a front-wheel drive hatchback. Although the first hot hatchback from AMG won’t debut until the Geneva Motor Show in March 2013, Mercedes decided to whet appetites with a couple of teaser images. The car in the photos wears virtually no camouflage, and has the requisite hunkered-down stance, big wheels and tires, and body kit of an AMG car. 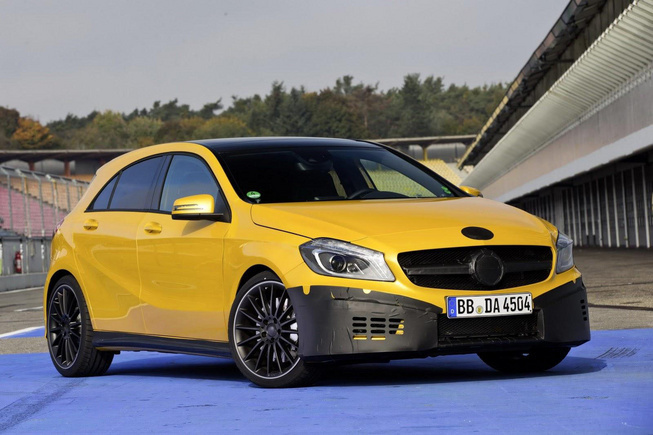 It also wears a version of the Solar Beam yellow paint available on AMG’s Black Series models. However, on this little hatchback, the overall effect is more boy racer than high end European performance car. The A45 really needs the chops to prove that it isn’t just a cynical exercise in cost-cutting. It will reportedly have a 2.0-liter, turbocharged four-cylinder under the hood. Autocar reported earlier this year that the engine, which also does duty in the regular A-Class, will be tuned to 330 horsepower and more than 295 pound-feet of torque. The only available transmission will be a seven-speed, dual-clutch, automated manual. Front-wheel drive cars don’t do well with large amounts of torque; all that power can actually tug the wheels in a phenomenon called “torque steer.” To cancel that out, AMG will equip the A45 with all-wheel drive. That should quiet the torque steer, and hopefully give the car better grip as well. The all-wheel drive system, designed by Haldex, will reportedly send most of the power to the rear wheels when the driver puts his or her foot down, which could mask the A45’s humble origins even more. Although it’s still a bit unorthodox for AMG, the A45 is shaping up to be a competent performance car. It will need to be competent, too, because this three-pointed star won’t be the only premium performance hatchback on the market. When it goes on sale, the A45 AMG will face off against the BMW M135i and Audi S3, both of which are new for 2013. The BMW packs a 320 hp inline six and is available with either all-wheel drive or rear-wheel drive. The Audi has a 300 hp, turbocharged four and is only available with all-wheel drive. 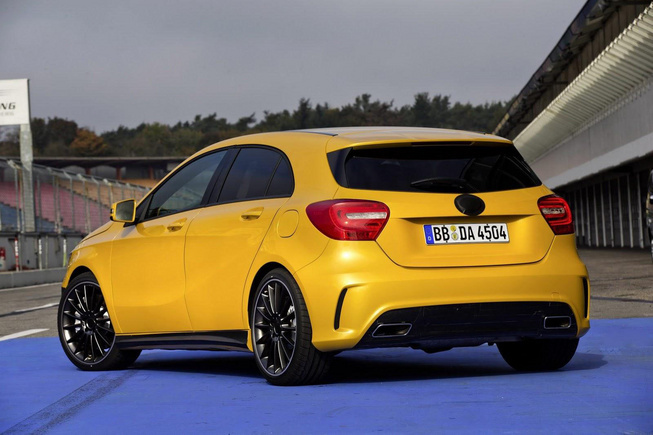 The M135i and S3 probably won’t come to the U.S., but the A45 AMG might. Mercedes has talked about bringing other A-Class variants, including the CLA “four door coupe,” to the States, so why not include this performance version? At this early stage, its hard to tell exactly what Mercedes’ plans for the AMG are. Look for more information, and more detailed specifications, in the coming months.